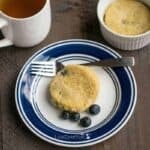 An easy to make blueberry low carb keto gluten free coffee cake. 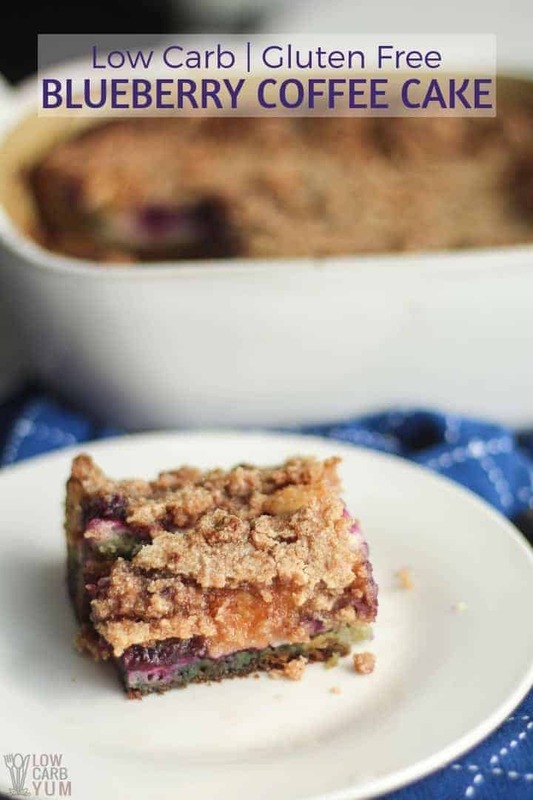 The sugar free cake layer is topped with cream cheese, blueberry, and cinnamon streusel layers. We just picked over ten pounds of blueberries so I was looking for a yummy way to bake some of them up. I already made a keto blueberry cheesecake so I searched for something a little different. 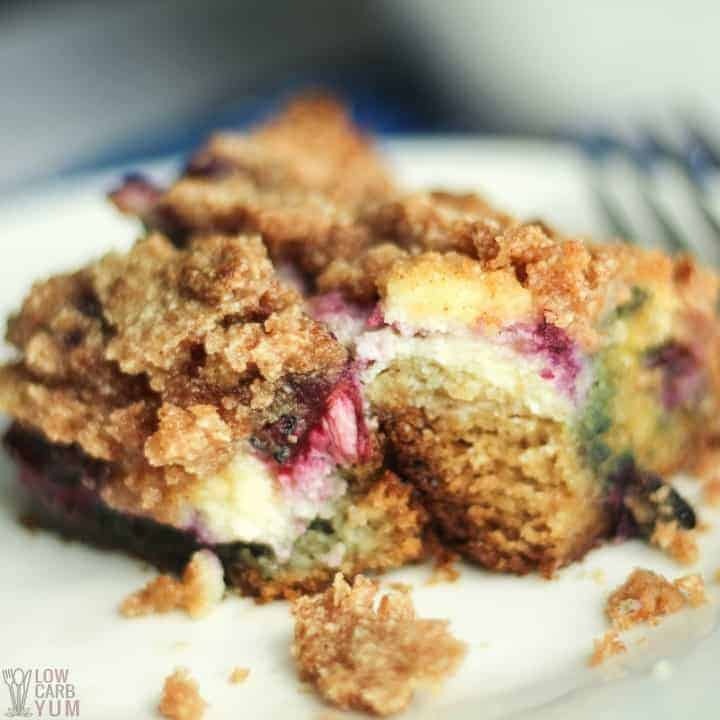 I found a recipe for low carb blueberry cream cheese coffee cake on the Low Carb Diet site at About.com. Because it got really good reviews, I decided to give it a try. It’s a pretty easy low carb coffee cake to prepare. But you do need to do it in stages as there are three primary layers: the cake bottom, the cream cheese filling, and the streusel topping. The topping uses almond flour, cinnamon, sweetener, salt, and butter. 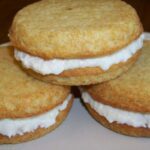 In the cream cheese filling there’s a blend of cream cheese, egg, and sweetener. Blueberries are also sprinkled over the filling. 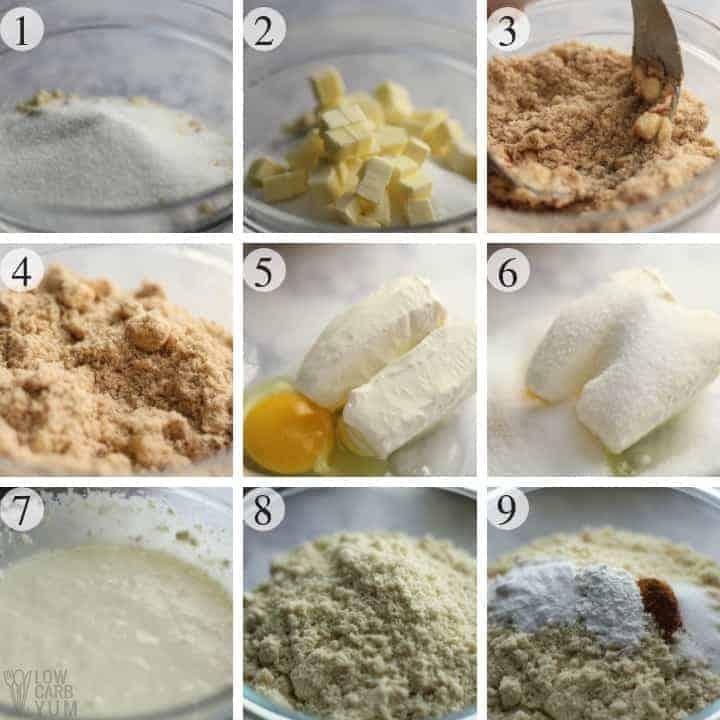 For the cake base, the ingredients are almond flour, baking powder, baking soda, cinnamon, salt, sweetener, sour cream, oil, vanilla extract, and eggs. 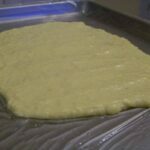 To begin, preheat the oven to 350°F and grease a 9×9-inch square baking pan. Then get the topping ready by cutting butter into the blend of almond flour, cinnamon, sweetener, and salt (photos 1-4). The cream cheese filling is made next by mixing the softened cream cheese with egg and sweetener using an electric mixer (photos 5-7). 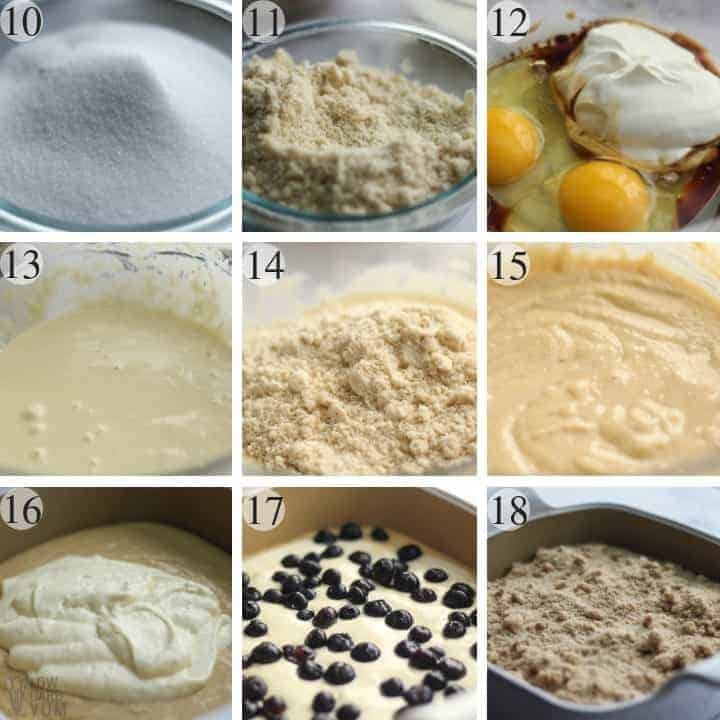 Then, get the dry ingredients of the cake layer mixed together by whisking almond flour, baking powder, baking soda, cinnamon, salt, and sweetener in a medium bowl (photos 8-11). The wet ingredients are combined next by mixing sour cream (or yogurt), oil, vanilla extract, sweetener, and eggs in a large bowl with an electric mixer (photos 12 & 13). At this point, the dry ingredients are stirred in (photos 14 & 15). Now that the layers are prepared, it’s time to put them all together. First, spread the cake batter into the pan. Next spread the cream cheese filling over it. The blueberries are sprinkled on top of the cream cheese layer. Then, the streusel topping is sprinkled over everything for the top layer. It’s then baked for 30 to 40 minutes or until the cake layer tests done. Once it’s cooled, it’s ready to slice and enjoy. 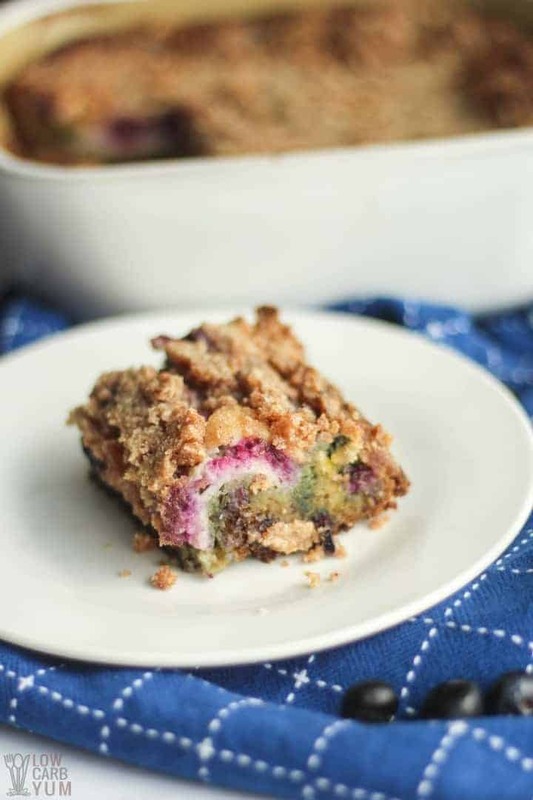 The filling in this blueberry gluten free coffee cake does taste similar to a cheese danish. However, it would be much better to have more of this cheesy goodness. Therefore, I will likely modify it next time I prepare it. I’ll use a whole 8 ounce bar of cream cheese when I make it again. And, I’ll add in more blueberries. The sugar free cake layer was very moist. At first, I thought it could have been a little sweeter, but I wouldn’t want to add any more sweetener as there is a good amount in the entire recipe. And, if you’ve been on a low carb diet for a while, you may actually want to reduce the sweetness. 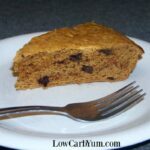 The original recipe used Splenda, but I changed it to use a monk fruit sweetener in this low carb coffee cake. I’ve decided to stop using artificial sweeteners and use only natural based ones. Monk fruit is my favorite sweetener, but it can be difficult to measure if used in pure form. That’s why I like a blend that contains erythritol which is a non-impacting sugar alcohol. 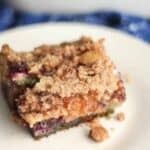 If you decide to give this low carb gluten-free blueberry cream cheese coffee cake a try, I’d love to know what you think. And, also any modifications that you made. 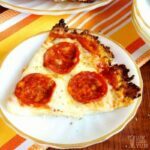 Enjoy this keto friendly breakfast cake! And be sure to leave a comment below to let us know what you think. A moist blueberry coffee that has a luscious cream cheese filling. 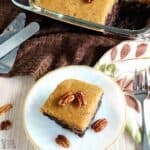 Almond flour is used to make this delicious low carb and gluten free cake. Preheat oven to 350°. Butter or oil 9X9 inch pan. Mix 2 cups of almond flour, baking powder, baking soda, ¼ teaspoon cinnamon, ½ teaspoon salt, and ¾ cup sweetener (if using a powder). Set dry ingredients aside. Blend the sour cream (or yogurt), oil, extracts, liquid sweetener (if using), and 2 eggs and mix well. Add the mixed dry ingredients and blend well. For more cheesy goodness, add in a whole 8 ounce bar of cream cheese. More blueberries can be added if desired (but carb count will be higher due to the natural fruit sugar). Very tasty and had a nice rise to muffins. Hi I wanted to make the blueberry coffee cake. I only have splenda now, so would I use the amount you stated in the recipe? If not how do I figure out how much to use. I’m alway confused when it say 1/2 cup or equivalent. Thanks. Looking forward to trying this!! It’s the same amount as “low carb sweetener” is a one-for-one sugar sub like Splenda. 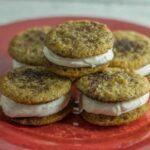 this THE BEST low carb dessert I’ve ever made! I did mix up my sweeteners to lessen the weird aftertastes of them. I used part sucralose, part erythritol, part stevia. Thanks for the feedback! Combining sweeteners has always worked out best for me and I’ve found I can use a lot less when blending them. Hi Lisa. I hope that I am not to late to ask a question, I don’t see any dated 2018. I really like the idea of a low carb coffee cake, I’m going to make it today. I’m feeding a lot of people and I want to double the ingredients and bake in a 9””X11” dish. Do you see any problems with me doing this? 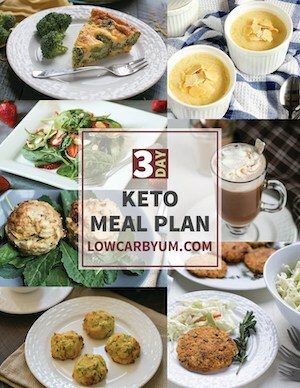 So far your web site is the best one that I have for low carb recipes. Thanks so much. I baked this in a 9×9. Doubling would be fine in a 9×13-inch pan. I have the doubled recipe cake in the oven now. I checked at 30 minutes and it’s still cold inside, but will check again at the 40 minute mark. . Any idea of how long to increase the time for the doubled batch? I’m excited to try it! It depends, but generally, it’s about 1.5 times the original time. Made it the second time with these changes: Used low carb Brown sugar for topping, used 8 ounces of cream cheese for cream cheese layer, used 1/2 cup white Splenda and 1/4 cup brown for the cake layer. I baked it at 325 in a glass 8×8 square pan. It browns nicely without burning. This cake is the BOMB! Better than anything I have eaten or baked in my entire life! Thank you, Lisa. Thanks for sharing your mods! Made this blueberry coffee cake for breakfast. Absolutely divine! Followed the recipe exactly. Turned out great. 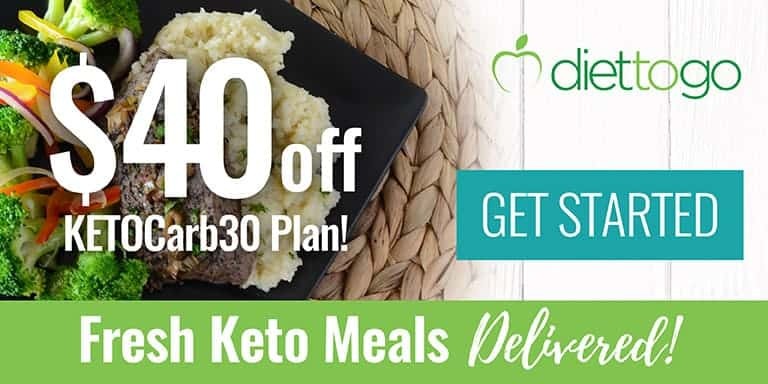 Can’t wait to share with my keto friends. Very good! Turned out great! How do you get 16 servings from a 9×9 pan? That’s a teeny tiny serving. I thought the typical 9 slices were too large so I slice it into four rows of four. Oh MAN! Do yourself a favor and make this up the day before it’s needed. WOW! It seems to be less ‘mealy’ after sitting overnight. Yum-O!! YUM! I baked it in a 8×8 Pyrex. I think next time (oh yes, there WILL be a next time!) I’ll put it in a 11×7 pan. Pretty sure I ended up over baking it to try and get the middle done. The cream cheese was still cold when I checked it at 30 minutes. My struesel topping got weird. I did add a splash more almond extract. The only thing I don’t care for is that usual grittiness (or chunks) that almond flour brings. Other than that, the flavor is phenomenal! And is smells SO good baking! 10 out of 10 would serve to unsuspecting visitors, provided they don’t have a nut allergy! Did you use the really fine almond flour? I find it helps with that grittiness. Absolutely! I find sweeteners to be a personal preference. What pan did you use when you made it? I used a 9×9-inch stoneware pan. Made this today and it was great! For the cake batter i only use 9 stevia packets because i ran out of the Swerve and it turned out just fine. I would recommend this recipe! Thank you!!! Could I make this into muffins? It looks delicious! It will work as muffins, just keep an eye on them as baking time will be shorter. 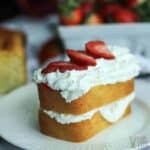 Can you substitute coconut flour for the almond flour in the cake mix? Other changes would be needed. It’s best to use a recipe that’s already been tested with just coconut flour. I used half almond flour and half coconut flour and it came out perfect! The recipe says 1 t baking powder …i assume that means tablespoon? But not sure since all the other ingredients have tbsp & tsp spelled out. 1 t = 1 teaspoon. 1 T – 1 tablespoon. I’ll make it clearer in the recipe. 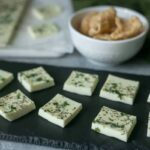 Can I use reduced fat cream cheese or stick with regular? This looks delicious and can’t wait to make it! Either type of cream cheese if fine to use. Am I being stupid or is the printing button not working? It’s working for me. It may just be your browser. Did you try another? LOL the print button isn’t working for me either but I’m giving this a try tonight. It’s not working for me either in my Chrome or Firefox browsers, but it works in Safari. I’ll see if the software developer can figure it out. I haven’t made this yet, because I was wondering if you cab substitute melted butter for the oil? Butter should work out fine in place of oil. 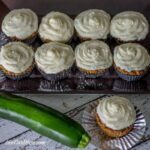 I have tried several keto/low carb desserts and this is the ONLY thing my husband has liked thus far. It was so moist and flavorful. Great recipe. This will definitely go in my arsenal. Win! My husband is tough to please too. I don’t have liquid sweetener, just powdered, will that work, and what amounts should I use? The measurements are for granular. Does that mean you use less for powdered? I only have powder. If you are talking stevia, the concentrated powder is twice as sweet as liquid so you need to use half as much. This was amazing!! Used swerve instead with the same measurements, was definitely sweet enough for me (could even have used less). Thanks! I am making this today and i am using 8oz of Cream cheese and 2 cups of frozen blueberries. I am very excited to How this is going to Turn out! I’m sure it tastes delicious. It is very delicious. However I would use less sweetener in the streusel topping as the sweetener overpowered it. Good to know it’s great without the streusel which would lower carb count as well. That sounds like such a delicious sub for the sour cream! This was absolutely fantastic. I used erythritol for the sweetener. Definitely a home run dish. So happy you liked it. I need to make this one again! How much erythritol did you use? Erythritol is about 60-70% as sweet as Splenda so you’ll want to add a little more. I just made this and it was amazing! I did use 8oz cream cheese and a few more blueberries. I would eat this not even in low carb! It does sound amazing with the extra blueberries and cream cheees. The topping call for “1/2 cup Splenda or equivalent liquid sucralose” which is 4 ounces. On Amazon, liquid Splenda is nearly $5 per ounce and alternatives are similarly priced. The liquid sucralose lasts forever because you only need a tiny amount. You could use a store brand Truvia or Splenda. This looks so yummy! I’m just wondering, are all the recipes on this site diabetic friendly as long as you stick to the serving size? Low carb recipes are perfect for diabetics. As long as you stick to the recommended serving, you shouldn’t get a spike in blood sugar. You need to subtract the erythritol. What do you mean subtract it? Sorry, it’s a net carb count, not total. I need to eventually get the full macros for this recipe. I made this this morning. It was really good. Made a few changes since I didn’t have all the ingredients. I didn’t have blueberries so I used a little low sugar raspberry jam. I used Pyure erythritol/Stevia sweetener. And I didn’t have any sour cream or yogurt so I thought I might use heavy whipping cream lol ( dont judge, I REALLY wanted to make this! ), which means, one small slice and I feel like a stuffed chicken. But it was oh soooo good. And will probably last me awhile :). Thanks! Thanks for sharing how you made it Shana. Sounds great with the modifications! My cake layer was so smooth that I couldn’t spread the cream cheese on top. The chunks just sank into the cake. Is the cake supposed to be baked a bit first then spread cream cheese? Or was mine just too firm still? I just kind of dropped the cream cheese mixture in different spots on the cake. It’s not really “spread” on. I put the cream cheese and egg in my mini blender and blended it up a bit, it almost poured on top, worked great! I looked in vain for any coffee in the recipe! Am I right to assume that this is a term you use in America for a cake that’s good to eat with a cup of coffee, rather than one which contains coffee? I made this cake today and it was very very yummy. I used Swerve confectioners, in the same amounts, and it turned out perfect. I will be making this again! Hi, I have made this twice! It is Amazing! I was wondering if you could use any other berry or fruit. Any berry or fruit should work just as well in this recipe. Do you recommend fresh or frozen blueberries? Either fresh or frozen works in this recipe. If I use erythritol (Swerve) instead of Splenda do I need to increase the amount, or use an equal amount? Thanks! Splenda is generally has a sweeter taste than Swerve so you may need a little more. Tasting as you go will be the best way to ensure to don’t over do it. It’s two tablespoons oil and two teaspoons extract. Can use all vanilla extract or half vanilla and half almond. Thank you, Lisa! Looking forward to trying the recipe! 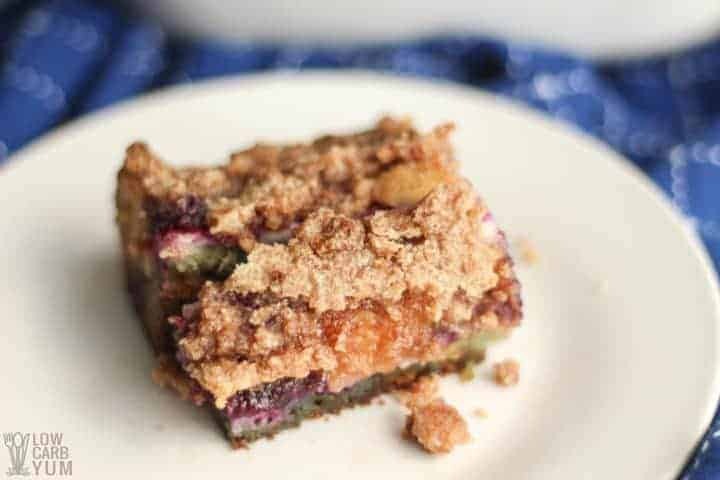 On the Blueberry Coffee Cake – what is the amt. of oil? and what extract?